Emmanuel Ekpo has yet release a brand new titled "Love Words Love Actions". He is a Lawyer by training and a minister of God by calling. He is a skilled and anointed music minister, director, song writer, trainer, teacher and preacher of the word of God. Through this song, he expounds on the need for Love to be expressed both in words and actions in the spirit of truth. He teaches that it would take both Love Words and Love Actions if our love indeed is to be deeply communicated, understood and felt. 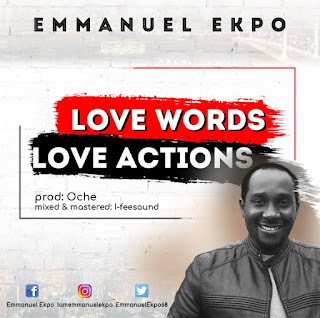 Emmanuel Ekpo is currently the Music Director at the Summit Bible Church HQ, Abuja, Nigeria.